The winner of last week's give-away is SarahZ from Montana. Thank you everyone for your comments, I loved learning about your quilt top "holding areas". A few weeks ago I went to visit my sister in Tucson on family business, and (don't tell her, but) the definite highlight of the trip for me was her antique amish quilt. And since I'm in a drunkard's path craze right now, I gasped and immediately fell. in. love. . . totally. mesmerized. by this quilt. it's simply breath taking . . . fascinating. There are so many things to think about. 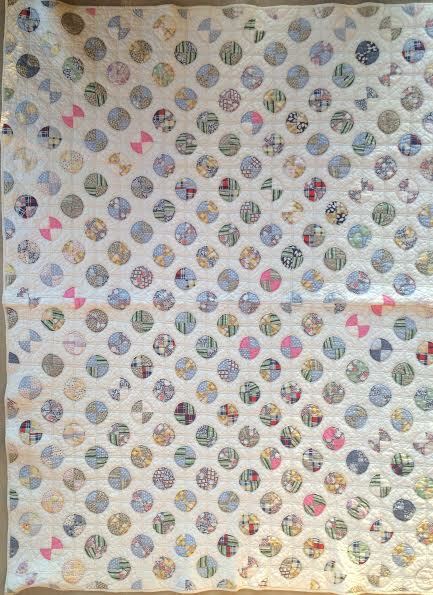 First, these old "modern" quilters totally got the negative space thing, and the "no border" thing. This could totally be found in the "modernquilting" hashtag on IG. Now, where exactly is the block? 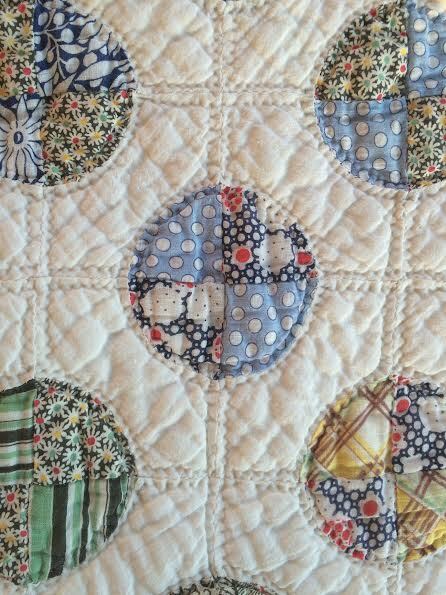 Are they sewing the quarter circles into the corners first then sewing the rows together? like I did in this quilt? They didn't have design boards on the walls . . . did they? It's just so fascinating. 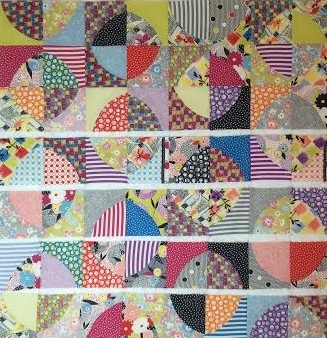 And did they know about the stack and sew method that makes piecing so much faster? I haven't done much research on old quilts. But I'd say this is very old, all hand sewn, no rulers, templates, rotary cutters or spinning cutting mats (and for that matter, no chocolate covered almonds or pita chips from Costco), and the fabric? I'm assuming from the maker's scraps or maybe from old shirts or dresses or something, but not from a local quilt shop. Could it be 100 years old? probably more like 70 or 80 years. simply beautiful. 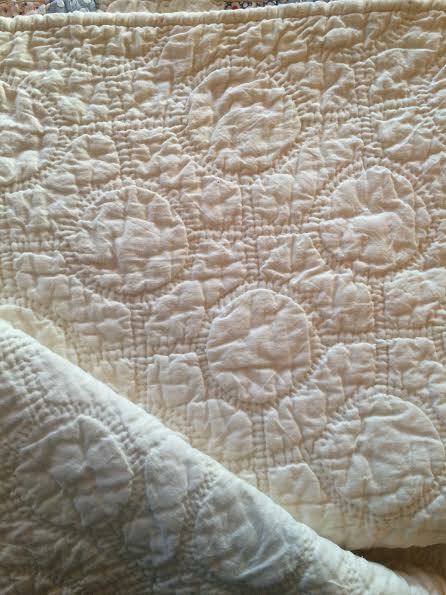 I wonder if they had cotton quilt batting by the bolt back 100 years ago, cuz that shrunk up so nice. I guess I should do a little research on quilt making from years past. love. peace. beauty. color. contrast. old. art. creativity, work of love. GIVEAWAY: closed. Hydeeannsews, I'll be contacting you. 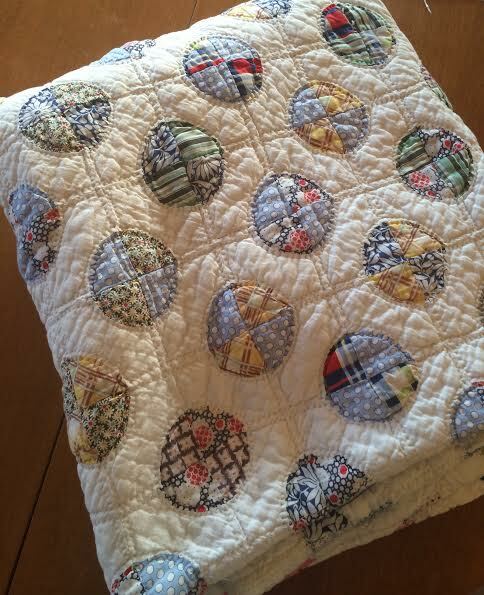 I know, I know, I'm getting a little carried away with the give-away thing, but with the purging I've been doing, I'd much rather ship "my excess" to new quilting friend then give it to an establishment that will store it in a big truck for months before the sorting process. Besides, I can visit with and learn from all of you with out leaving home (in other words, I may or may not be in the same clothes I've worn for a few days). And, this is a fascinating topic for me. Anything you can share would be fun. I'd especially love to see links to places you've learned from. I had to take an unexpected trip this week, so I don't have a picture of anything to give away, but I have tons at home and promise to have something good. This is such a gorgeous quilt! I could almost feel the soft cottony texture! Thanks for sharing! That quilt is so inspirational! I would love to do one, but I highly doubt mine would come out near as beautiful as that one! I could sit on the sofa and cuddle up in that for hours...days...? 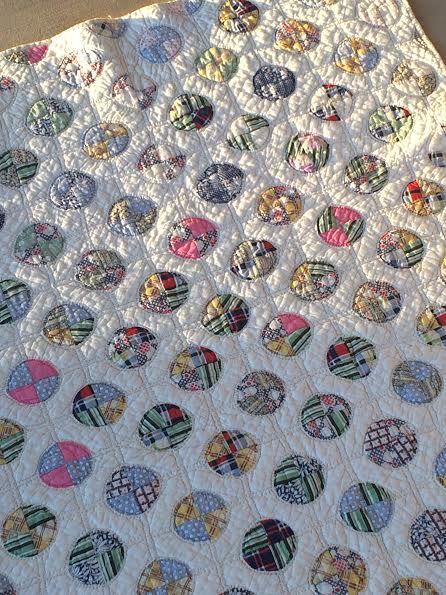 I love the circles and the 'squishy goodness' of this quilt ! Thank you (and your sister) for sharing ! Have a blessed Resurrection Sunday ! I can see why you were taken by this quilt. It is stunning. Like you I have looked at the pictures and wondered just how it is put together. It would certainly be a lovely one to replicate. Let me know if you work it out. wow. it's spectacular! so much to look at, like you said. and you're right about the folding rotation. =) i'm really curious why it's refered to as amish because they never use prints. i guess it's the pattern, but i don't recognize that from my amish quilting books, either. maybe i need to revisit the books. i hope you had a great visit with mary lee! Wow! This is a gorgeous quilt. I just love it! Thanks for sharing it with us. 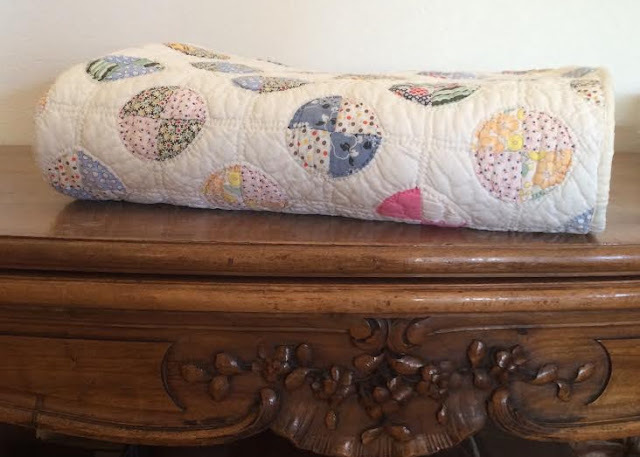 It's definitely a treasure to have a quilt like this. Thank you for the little lesson in folding. Your blog is fantastic! 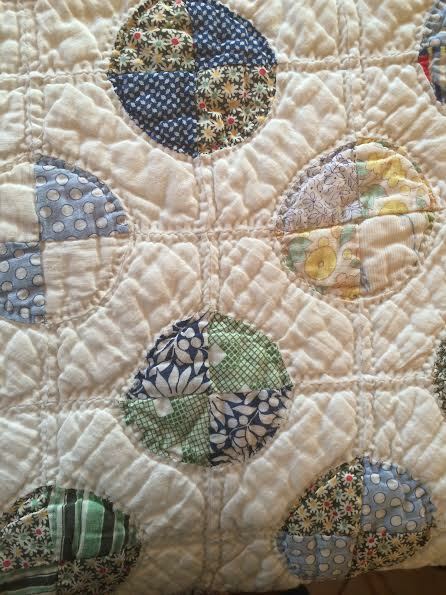 I found an old tied quilt wi an appliqued X in the center and quarter circles in each corner. When blocks sewn together circles are formed resulting in an X and O quilt. I can't find any reference or photos for this pattern. Anyone familiar wi this ?